The initiative, launched this week, will include a media awareness and poster campaign aimed at encouraging schoolchildren and their parents to choOse alternative modes of transport now that the schools are back. Local media and school authorities are being asked to help create awareness among schoolgoing children and their parents, particularly first years who will carry the change of attitude through for the next five years. 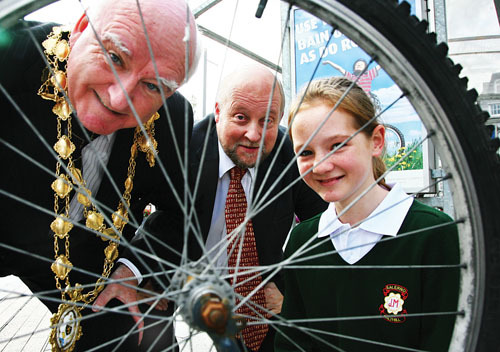 “Galway Chamber Traffic and Transportation Forum would like to see schoolgoing children, teenagers and their parents consider alternative means of transport such as the bus, cycling or walking where possible,” said Dr Chris Coughlan, the Chairman of Galway Chamber Traffic and Transportation Forum. This initiative will be followed by a similar initiative from the Industrial Committee of the Forum which will encourage workers to ‘Bus it, Bike it, Walk it – Give the Car a Break’. What did your relatives do in the war?